The new EU succession rules have turned estate planning for European assets on its head! A series of conferences organised by Rosemont in Hong Kong and Singapore will explain the significance of these changes. The rules have changed - what do I need to do? On 17th August 2015 new EU succession rules (Regulation (EU) No 650/2012 or the “Regulation”) entered into force, which scope affects every person (EU national or otherwise) owning assets in a European country. From now on, international successions can be governed either by (i) the law of the last habitual residence of the deceased, or (ii) the national law of the deceased, if the latter unequivocally expressed such choice before his death. The Regulation simplifies the current situation: a given succession can now be treated coherently, by one single court applying one single law. Citizens owning European assets shall be aware of this reform and its practical implications, so that they can organise their international succession. 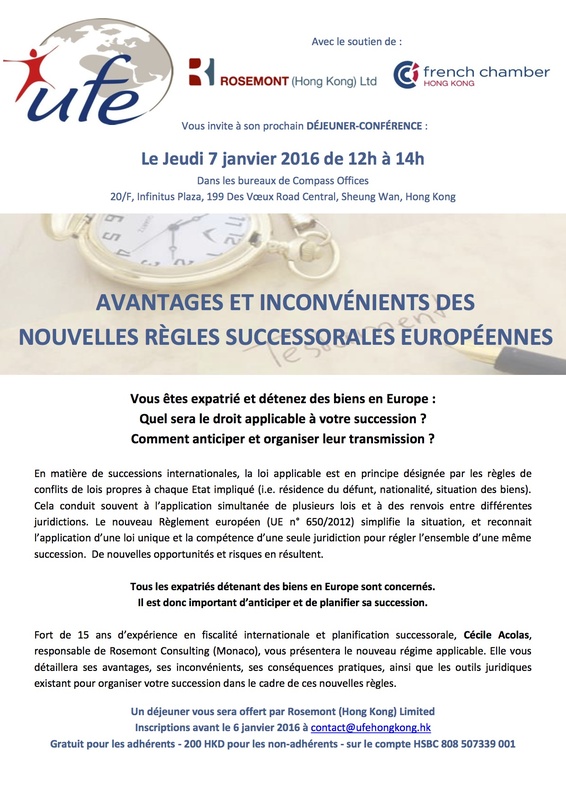 Cécile Acolas, Partner and Director at Rosemont Consulting, will discuss how these rules will affect all expatriates in Hong Kong and Singapore who own assets in Europe (whether real estate or movable assets). Contact either Raphael Beaudrey in the Rosemont Hong Kong office at r.beaudrey@rosemont.hk or Pierre Vanrenterghen in the Rosemont Singapore office at p.vanren@rosemont.sg for more information on the seminars or to arrange a meeting to discuss how this topic might affect you and how Rosemont can help you with your estate planning.